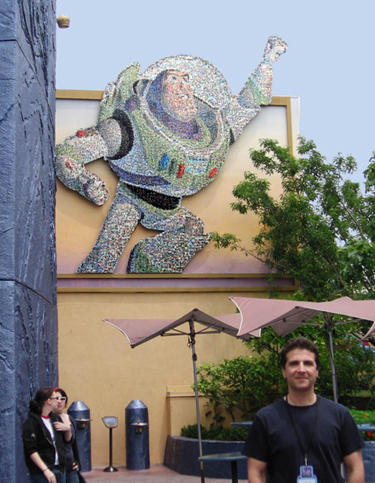 When Disneyland planned its 50th Anniversary celebration in 2005, they called on Roy Feinson to create a series of large scale mosaics throughout the park. The public was asked to submit photos taken in the last 50 years of their trips to Disneyland. Using these hundreds of thousands of images, Roy created 38 spectacular mosaics which were installed all over Disneyland and California Adventure. These whimsically engrossing installations captured the attention and imagination of all visitors to the parks during this special year. Click on the thumbnails below to see some of the mosaics around the park. (NOTE: use left/right arrow keys to navigate). I was thrilled to see these when they were on display for Disneyland’s 50th. My pictures were in several of them and it was exciting to find them. I always hoped there would be a book published with these images. Did that ever happen?